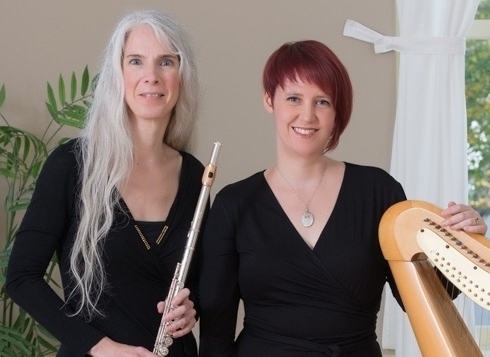 Nova Scotia's WILDWOOD Flute and Harp Duo, consisting of Jennifer Publicover (Irish and modern flutes) and Alys Howe (harp and vocals) specializes in performing traditional Celtic and classical music, from the concert stage to your special event. Alys and Jen met in 2011, when Jen’s trio “Papilio” invited Alys as a guest to contribute harp to their debut album “First Flight”. Since then, they have performed at The Boxwood Festival in Lunenburg, headlined several Christmas concerts organized by Alys to benefit Hope for Wildlife, and played many private concerts and events in Nova Scotia. WILDWOOD Flute and Harp Duo unites passion for traditional Celtic music with the finesse of classical expertise, and contribute their musical sensitivity and professionalism to a diverse range of projects and settings.